filling. 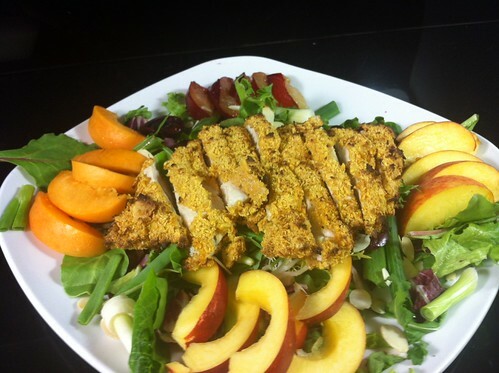 This dish features a breaded honey glazed chicken breast on top of a bed of arugula and spring mix. This salad is also topped with peaches, cherries, apricots, plums, nectarines, toasted almonds, grape tomatoes, and green onions with a light tarragon vinaigrette. With perfect outdoor-eating weather, this dish would be great to enjoy on our patio dining area! know what exactly quiche is, well it is most easily described as an open faced pie or pastry dish that is filled with a savory custard filling, meat, cheese and vegetables. There are many different variations of quiche depending upon what type of meats, cheeses and vegetables are used. 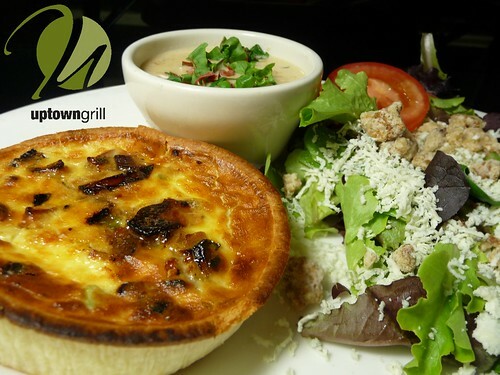 We have chosen to serve our own variation of a traditional Quiche Lorraine made applewood smoked bacon, comte cheese (which is french and its taste is strong yet sweet... it is delicious!) and caramelized vidalia onions. I recommend coming in and trying this dish pronto because we only make a certain amount of fresh quiche daily.